When you take a moonlit stroll on the beach, how often do you think about the tiny grains of sand creeping in between your toes? From above, sand seems like a bunch of tiny brown rocks, perhaps peppered with occasional shells or cigarette butts. But sand has a far more fascinating story to tell. Composed of the remnants of volcanic explosions, eroded mountains, dead organisms, and even degraded man-made structures, sand can reveal the history—both biological and geologic—of a local environment. And examined closely enough,sand can reveal spectacular colors, shapes, and textures. 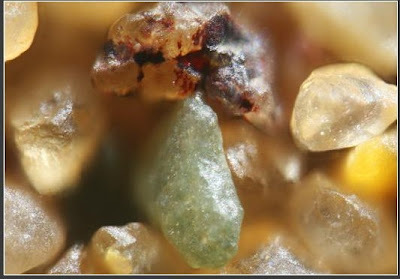 Bright green olivine is a significant mineral in Hawaii’s slow-flowing basaltic lava and is rich in iron. 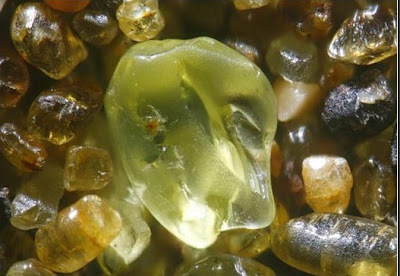 Its density allows it to separate from other sand grains in the rolling and depositing action of waves, which results in the accumulation that tints this beach a yellowish green. 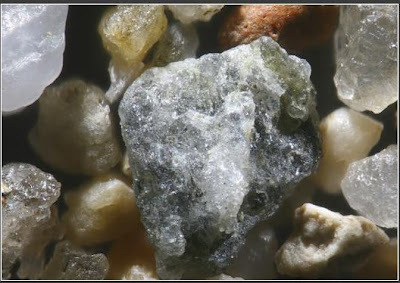 Dense sands like olivine are also resistant to weathering, allowing it to endure millennia of constant waves. The pitted and frosted surface of these grains is typical of desert sand, where grains constantly collide with one another. Many desert sands have a faint red color caused by a thin layer of iron that precipitates from the atmosphere and coats the grains. Metamorphic minerals, which form at high temperatures and pressures underground, can become heavy, brightly colored sands like these. But color is often unreliable for identifying different types of sands. 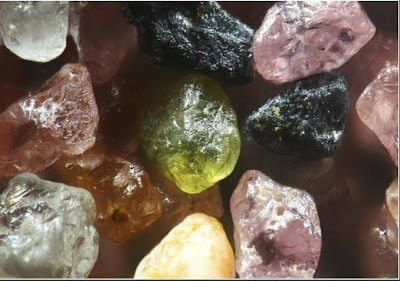 Here, the pink and red grains are garnet, but garnet can also be brown, black, green, or orange, depending on the chemistry. The bright green epidote in the center can also be gray, brown, or nearly black. The angular, black magnetite—the most common naturally occurring magnetic material on earth—is always black, however, and is frequently found near garnet. 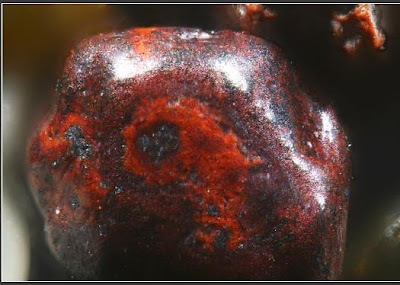 This sand, red from iron oxide, was found at Makena Point, Maui. It eroded from igneous rock, which was produced by the solidification of molten magma. 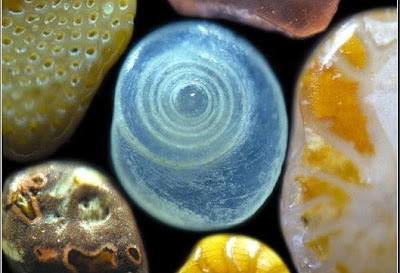 Not all sand is made of tiny bits of rock. Biogenic sand, which forms from the remains of marine life, is the major ingredient of many tropical beaches. The grains here are tiny fragments of a baby sea urchin shell. The raised bumps on the white grain represent the sites of insertion for the sea urchin’s spines. The blue grain has eroded to the point that the raised bumps have been completely rubbed off. Looking like a puffy white star studded with little pearls, this is the shell of an amoeboid protist called a foraminifera, or foram. 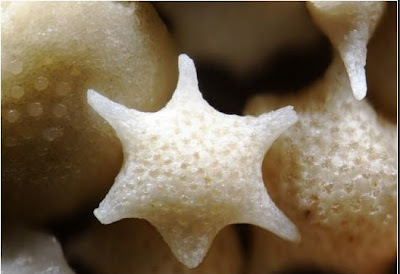 An estimated four thousand types of forams live in the world’s oceans. The shells, called tests, are made mainly of calcium carbonate, which the animals derive from carbon atoms in the air and water. 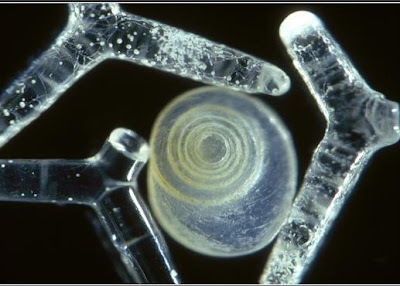 Forams thus play a significant role in the carbon cycle. The glasslike needles are sponge spicules, which form the internal skeletons of sponges. 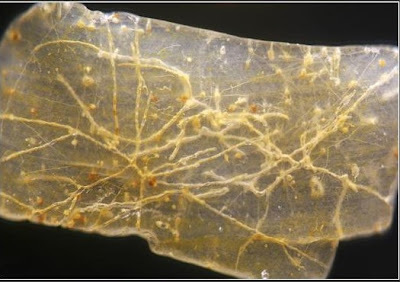 They are made of silica, can be found in a variety of bizarre shapes (including spiders and fishhooks), and are hard and sharp enough to cut through human flesh. They surround the tip of a spiral shell, composed primarily of calcium carbonate, that has broken off and eroded. Worms have burrowed trails into this shell fragment. Worms like these are abundant in the ocean as well as on land. 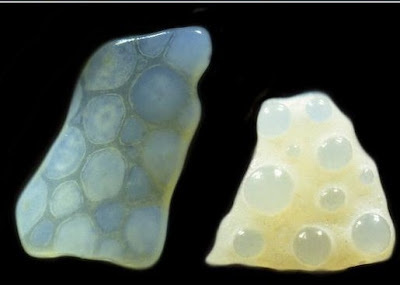 Man-made objects can also become sand. This grain was found on the Greek island of Delos, one of the most important mythological, historical, and archaeological sites in Greece. Delos had no indigenous marble, and an enormous amount of marble had to be quarried and brought to the island to erect the temples. Over the years, the marble blocks have eroded and the local beaches are now peppered with different types of marble. Some sand comes from decidedly less artistic human activity. 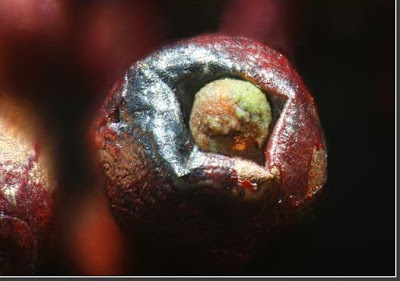 Here, a small grain of copper is impacted into a larger nugget, also of copper. These grains precipitated downwind of an unregulated, smoke-belching copper smelter.